This book is about harnessing the power hidden in foods to change our genetic predisposition for disease. Dr. Gaynor provides insight and an action plan. While conventional medicine focuses on treating symptoms with prescription drugs, Dr. Mitchell Gaynor's pathbreaking plan goes straight to the most fundamental level: our DNA. We cannot alter the genes we are born with, but we can change how they are expressed over the course of our lives through targeted foods and supplements. 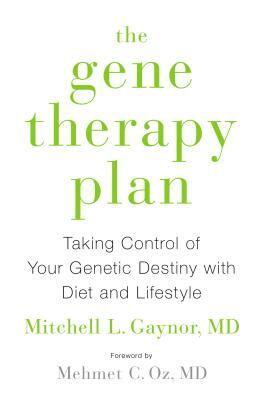 The Gene Therapy Planpresents clear and evidence-based approaches to diet, including juices, recipes, and menus. Empowering and informative, with inspiring stories from Dr. Gaynor's decades of clinical practice, this forward-looking book by the author ofNurture Nature, Nurture Healthputs our genetic destiny back into our own hands. MITCHELL GAYNOR, M.D., is the founder and president of Gaynor Wellness and a clinical assistant professor of medicine at Weill-Cornell Medical College with more than twenty-five years of experience treating patients. His work has been featured in The New York Times and he has appeared on many national television programs, including Good Morning America, The Dr. Oz Show, and The Martha Stewart Show. He lives in New York City.